I have 5 mini quilts to complete this month, including helping my son to finish his. So, I'm calling my Cotton & Steel Mini quilt my official June goal for A Lovely Year of Finishes. 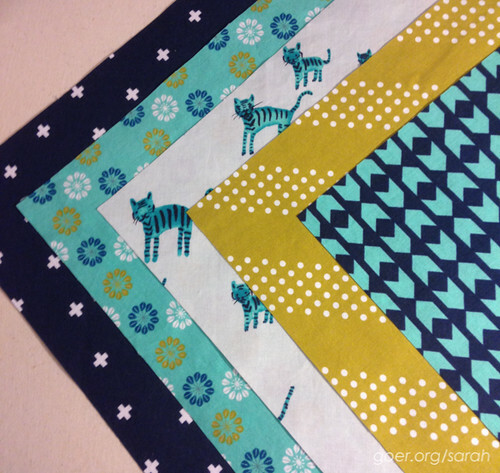 The shipping deadline is June 19 as it's going internationally for the Cotton & Steel Mini Quilt Swap from Instagram. I struggled a little to come up with a plan, but settled on blues. Here's the palette I'm using for the quilt. I like that the Daisies fabric tied it all together. I'll be using Netorious in Kerchief for the background (not shown). I'm leaning toward binding in the XOXO, but I won't make a final decision until the quilt top is finished and quilted. I designed this quilt to be layer cake friendly (despite the fact that I was working from yardage, and that I ended up cutting two of my fabrics on the bias). 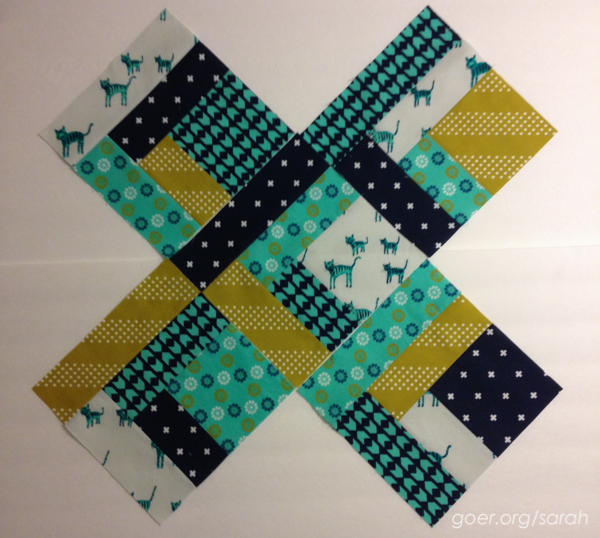 I look forward to trying it out with a full layer cake for a larger quilt. It was a bit of a puzzle getting the blocks created so they could be set without like fabrics sharing a seam between blocks. Linking up to ALYoF June Goal Party. Posted in Quilting. 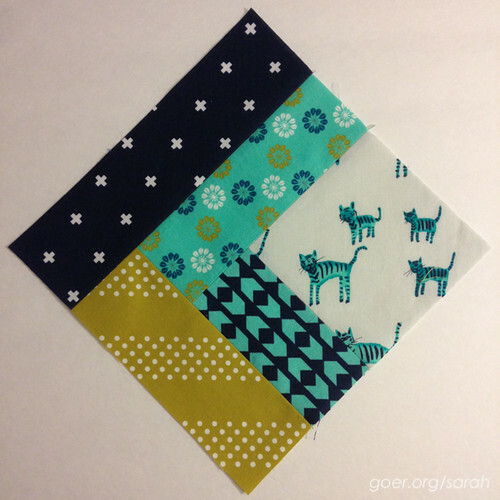 Tags: ALYoF, goals, mini quilt on June 6, 2015 by sarah. Love it and of course the fabric is gorgeous. Ohhhhhh, I like that!! Good luck with your finish. It's looking great! I love they way you pieced the fabrics to make sure no two alike fabrics met up! Looking forward to seeing it complete!